The application used to apply for federal student aid. Apply as soon as possible on or after Oct 1 to meet school and state aid deadlines. You will need your and your parents’ tax returns or estimated tax information and documents such as W-2 forms, bank statements and business and mortgage information in order to complete the FAFSA. Applying for federal student aid is FREE; learn more at the FAFSA website. 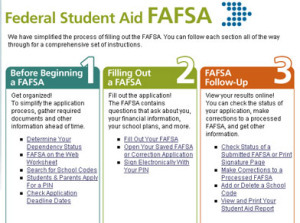 Summarizes all the information you provided on your FAFSA. Your SAR will usually contain your Expected Family Contribution (EFC), the number that is used to determine your eligibility for federal student aid, and may state a need for additional information. Pay close attention if the report states that additional information is needed or if your school asks for additional information. The number that is used to determine your eligibility for federal student financial aid. This number results from the financial information you provided in your FAFSA application. Your family’s income, assets and benefits are considered in determining your EFC. Your family size and the number of family members who will be attending a college or career school are also considered. Your EFC is reported to you on your Student Aid Report (SAR). The EFC is a way of comparing a family’s relative financial strength to that of other applicants. If your family’s income will be significantly less in the current year than the previous year, you can appeal your EFC with your college or university. Contact the school about this process. The total amount your school estimates it will cost you t0 attend school, usually expressed as a yearly figure. The Cost of Attendance includes tuition and fees, on-campus room and board (or a housing and food allowance for off-campus students), and allowances for books, supplies, and transportation. It also includes miscellaneous and personal expenses. Your school subtracts the Expected Family Contribution (EFC) from your Cost of Attendance. An award letter from a school states the type and amount of financial aid (grants, work-study, and loans) the school will provide if you accept admission and register to take classes at that school. See also financial aid package. The total amount of financial aid (federal and non-federal) a student is offered by the school. Provides a stipend to eligible undergraduate students. The stipend pays a portion of your total in-state tuition when you attend most Colorado public institutions or a participating private institution (currently Regis and the University of Denver). You must apply for COF. Check the website here to apply.